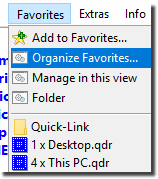 It is easy to manage the Favorites in the file manager, this is responsible for all four Explorer list views! 1.) ... Organize the Favorites in classic mode! 2.) ... Manage the Favorites in Explorer View! 3.) ... About the Favorites! 1.) Organize the Favorites in classic mode! For rename, move or delete of favourites. Click on the menu item "Favorites", then "Organize Favorites". In the Favorite you can also save view and the window size and other settings for all 4 Explorer Views . 2.) Manage the Favorites in Explorer View! (Image-1) Manage the favorites in a Explorer View! 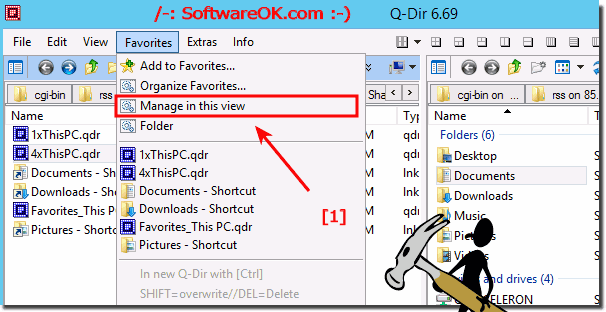 The Favorites in the File Manager Q-Dir, is for all explorer Views and other settings in the list view, this settings is saved in a *.qdr file, this is not only for Window 10 very good, but also for all other Wiindows and server operating systems. Than you have a fast and easy access to your hard disks, network folders, USB-sticks, floppy disks and other storage devices. And now you can save your favorite folder combinations as favorites to open them at any time in one shot. Up to 64 folder combinations can be stored in a favorite, since each of the four explorer is equipped with TAB's (i.e. 4 x 16 tabs) and Tree View plus Address Bar. 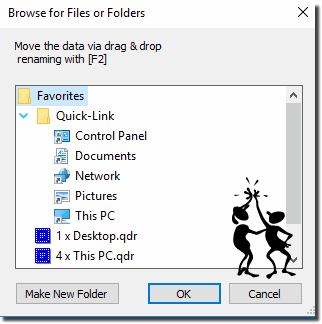 Q-DIR - FAQ-18: How can i manage or delete the favorites for all Explorer Views?